Forget the graham crackers. 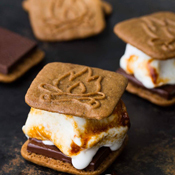 Your S'mores have been transformed. Around the campfire, in front of the fireplace or in the oven, our unique S'Mores Kit has everything you need to make this traditional iconic snack. Traditional Belgian speculoos cookies are packed with cinnamon, cloves, pepper and cardamom. 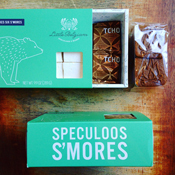 The cookies have a caramelized richness, and taste like crisp gingerbread wafers - the perfect bookends for fluffy vanilla marshmallows from The Candy and nutty dark chocolate squares from TCHO chocolate. This sweet gift is made to order with organic ingredients and contains enough goodness to make six amazing S'Mores. Eye-catching packaging makes this a must-have gift for summer, ski season & winter holidays! SPECULOOS INGREDIENTS: ORGANIC UNBLEACHED FLOUR, ORGANIC DARK BROWN SUGAR, ORGANIC CULTURED BUTTER (CREAM, CULTURE), ORGANIC EGGS, ORGANIC SPICES, BAKING SODA, SALT. MARSHMALLOW INGREDIENTS: CANE SUGAR, INVERT SYRUP (CANE SUGAR, WATER, ORGANIC CREAM OF TARTAR, KOSHER SALT), WATER, KOSHER GRASS FED GELATIN, ORGANIC VANILLA BEAN, KOSHER SALT, TAPIOCA STARCH, POTATO STARCH, ORGANIC COCONUT OIL. CHOCOLATE INGREDIENTS: ORGANIC CACAO BEANS, ORGANIC CANE SUGAR, ORGANIC COCOA BUTTER, SOY LECITHIN, ORGANIC VANILLA BEANS.